Piroplasmosis is an important animal disease that is a major constraint to the development of the livestock industry, often resulting in significant economic losses. Therefore, there is an urgent need to further understand the etiology of this and other tick-borne infections. Blood samples were collected from tick-infested animals from the Chakwal, Jhang, and Faisalabad districts of Punjab, Pakistan and from peri-urban areas around Hohhot, Inner Mongolia, China to investigate the presence of Babesia and Theileria species. In total, 450 blood samples were collected with FTA cards from cattle of the study areas of Pakistan; the genomic (g)DNA of one hundred and twenty samples from cattle in Inner Mongolia were provided by the Lanzhou Veterinary Research Institute, China. Following the extraction of gDNA, the 18S rRNA gene (V4 hypervariable region) of piroplasms was amplified in all samples using semi-nested PCR. Positively identified samples were sequenced for the identification of Theileria and Babesia species. The partial full-length sequence of 18S rDNA was amplified for species confirmation of Theileria-positive samples, whereas the RAP-1c gene was amplified for Babesia bigemina-positive samples. Semi-nested PCR results revealed that 144 (25.26%) samples were positive for piroplasms. Theileria annulata was the most prevalent species (115/144; 20.17%), followed by Theileria orientalis (16/144; 2.80%). Among Babesia, the only species recorded was Babesia bigemina (13/144; 2.28%). The present study reveals new data on the prevalence of piroplasm species in bovine populations of selected areas of China and Pakistan and their phylogenetic relationships. It is also the first detailed report of T. orientalis from native animals in Pakistan. The livestock industry is an important part of the economy in Pakistan, contributing 11.6% of the total gross domestic product during the economic year 2016–2017. According to statistics, there are 82.1 million heads of cattle and buffalo in Pakistan . Although it is estimated that two thirds of the human population of Pakistan is involved in the livestock sector either directly or indirectly, management practices and disease prevention and control strategies are poorly developed. Piroplasmosis is one of the most important diseases, constraining the livestock industry in tropical and subtropical areas of the world . It is caused by species of two genera of haemoprotozoa, Theileria and Babesia. In general, Theileria annulata and Theileria parva are considered to be the most pathogenic species, causing theileriosis in cattle and buffalo populations of tropical and subtropical areas, whereas Theileria mutans and Theileria orientalis are responsible for asymptomatic disease . Hard ticks of the genera Hyalomma, Rhipicephalus, Haemaphysalis and Amblyomma are vectors of these Theileria spp., resulting in fatal economic losses in endemic areas of Asia and Africa [4, 5]. Clinical manifestations of theileriosis include: increased body temperature (40–41.5 °C), followed by depression, watery secretion from the eyes, nasal discharge, inflammation of the lymph nodes and anemia . Bovine babesiosis is mainly caused by haemoprotozoans of the genus Babesia, including Babesia bovis, Babesia divergens, Babesia ovata, Babesia major and Babesia bigemina. Among these, B. bovis and B. bigemina are the most pathogenic species, transmitted by Rhipicephalus microplus, which is a globally distributed tick species. The other species, B. ovata and B. major, are transmitted by Haemaphysalis longicornis and Haemaphysalis punctata, respectively . The clinical signs of babesiosis include fever, icterus, hemoglobinuria and anemia . Diagnosis of the piroplasm species is usually done using Giemsa’s-stained blood smears, but this method cannot be utilized to identify carriers of the parasites, because the levels of parasitemia are low . Studies show that carrier animals can be source of infection for a long time . Serological assays have also been developed for detecting these parasite infections. Compared with other serological assays, such as indirect fluorescent antibody tests and compliment fixation tests, enzyme-linked immunosorbent assays are highly sensitive and easy to standardize, and, thus, are a preferred method for epidemiological studies [11, 12]. However, low specificity and false negative results in the case of carrier animals can hinder the efficacy of these tests . However, for epidemiological surveys, it is recommended to detect carrier animals . Molecular techniques can used comparatively reliably to determine the species spectrum of parasites in population studies, and species-specific PCR assays have been established for this purpose. Meanwhile, the development of reverse line blot (RLB) hybridization has enabled the simultaneous detection of various piroplasm species [15, 16]. PCR has been proven to be more specific and sensitive method for the identification of carrier and diseased animals in various studies worldwide. In Pakistan, most published studies report the use of Giemsa’s staining for the detection of piroplasm species . However, there have also been a few reports utilizing molecular techniques for diagnosis. For example, T. annulata has been detected by using species-specific primers in PCR [8, 17–19], but no confirmation of the results by DNA sequencing was provided. Gebrekidan et al. reported the presence of T. orientalis in Pakistan for the first time from imported and native animals, reporting no T. orientalis in native animals by conventional PCR and low prevalence (6%) in native cattle as compared with imported animals (25.4%) using multiplexed tandem PCR. Recently, Hassan et al. [21, 22] determined the presence of Theileria spp. by using recombinase polymerase amplification. In terms of the detection of Babesia spp., PCR has been used in epidemiological studies reporting the presence of B. bovis and B. bigemina [8, 23, 24]. In the present study, semi-nested PCR was utilized to identify several species of piroplasm at the molecular level. During July and August 2016, 450 blood samples were randomly collected from tick-infested but asymptomatic cattle in the Chakwal, Jhang and Faisalabad districts in Punjab, Pakistan. Blood was collected from the jugular vein using 10-ml disposable syringes and transferred to the four circles of a Whatman® FTA card (GE Healthcare Limited, Buckinghamshire HP7 9NA, UK) and allowed to air-dry. The FTA cards were shipped to Lanzhou Veterinary Research Institute, Chinese Academy of Agricultural Sciences Lanzhou, China for further processing. In addition, 120 samples of genomic (g)DNA collected from the blood of cattle in the field from Inner Mongolia, China were provided by the Vectors and Vector Borne Diseases Laboratory, Lanzhou Veterinary Research Institute, China. Genomic DNA was extracted from the FTA cards using the genomic DNA purification kit (Qiagen, Hilden, Germany) according to the manufacturer’s instructions. The DNA concentration was determined with a NanoDrop 2000 spectrophotometer (Nanodrop Technologies®, Wilmington, DE, USA). DNA was stored at -20 °C until further analysis. Semi-nested PCR was used to amplify the V4 hypervariable region of the 18S rRNA gene from the gDNA of cattle. For this purpose, universal primers were used that can amplify several Babesia and Theileria spp. . The first PCR reaction was conducted using primers RLB-F2 and RLB-R2, as shown in Table 1. 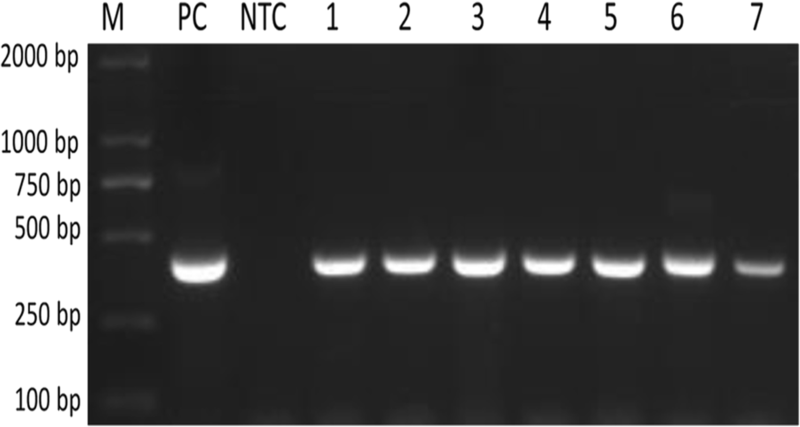 The reactions were performed in a final volume of 25 μl containing 12.5 μl Premix Taq DNA polymerase (TaKaRa, Beijing, China), 1.0 μM of each primer, and 2 μl of DNA template. The second PCR was carried out with the primer RLB-FINT (as shown in Table 2) used as the forward primer, together with RLB-R2. The reaction mixture was as in the first PCR reaction, except the template was replaced by 2 μl of the first PCR product. PCR products were electrophoresed on a 1.5 % agarose gel and visualized under UV light. Positive PCR products were excised from the gel and purified using a BIOMIGA EZgeneTM Gel/PCR Extraction Kit (San Diego, CA USA). The DNA fragment was cloned into pGEM-T Easy Vector (Promega, Madison, USA). Escherichia coli Trans 5α (TaKaRa, China) was transformed and plasmid DNA from the selected clones was identified using PCR with the set of primers T7 (5'-TAA TAC GAC TCA CTA TAG GG-3') and SP6 (5'-ATT TAG GTG ACA CTA TAG-3') to verify the presence of correct inserts in selected clones before proceeding with the sequencing process. The reaction cycling in the second PCR was optimized with primer annealing at 54 °C for 30 s. The correct inserted clones were shipped to Genescript® (Shanghai, China) for sequencing . To confirm the Theileria spp., a long fragment of the 18S rRNA gene (~1600 bp) was amplified from samples that were positive in short sequence amplification. The long fragment of the RAP-1c gene of B. bigemina (1054 bp) was amplified for species confirmation. The primers used are listed in Table 1. The obtained sequences were aligned using the MegAlign component of the DNAStar software program (Version 4.0 DNAStar, Madison, USA). After alignment with related Theileria and Babesia spp. 18S rDNA sequences retrieved from GenBank, parts of the cloning vector region were removed manually. The resulting sequences were then submitted to the GenBank database. A phylogenetic tree was generated based on the cloned sequences and the related Theileria/Babesia 18S rDNA sequences in GenBank by using the neighbor-joining algorithm in the MEGA 6.0 software . The evolutionary distances were computed using the Kimura two-parameter method . The phylogenetic trees based on long fragment of 18S rRNA gene of Theileria spp. and RAP-1c gene of B. bigemina were generated using the above-mentioned procedure. Semi-nested PCR was used to detect Theileria and Babesia spp. by targeting the V4 region of the 18S rRNA gene and amplifying a 393-bp fragment (Fig. 1). Of the 570 bovine blood samples, 144 (25.26%) samples were positive for piroplasms, showing an approximately 393-bp product band in the agarose gel. The PCR products of all the positive detected 144 samples were sequenced. 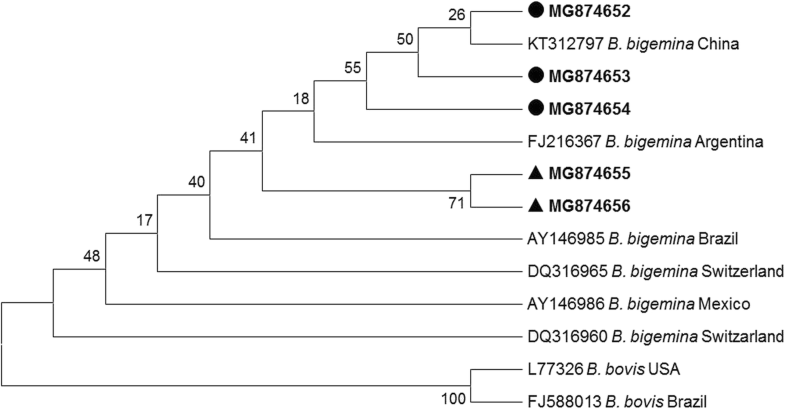 The phylogenetic analysis based on the short amplified sequences of the 18S rDNA V4 hypervariable region revealed three piroplasm species (T. annulata, T. orientalis and B. bigemina) in samples from the two study areas (Fig. 2). Theileria annulata (115/570; 20.17%) was the most prevalent piroplasm species. The highest prevalence of T. annulata was found in Chakwal (46.80%), followed by Faisalabad (10.75%), Inner Mongolia (10.0%) and Jhang (2.96%). The second most abundant species was T. orientalis (16/570; 2.80%). The highest prevalence of T. orientalis was found in Chakwal (6.38%), followed by Faisalabad (2.15%) and Inner Mongolia (1.67%). Theileria orientalis was not found in Jhang. Babesia bigemina (13/570; 2.28%) was the only species of Babesia found in any of the samples. The highest prevalence of B. bigemina was in Chakwal (5.31%), followed by Inner Mongolia (1.67%) and Faisalabad (1.07%); this species was not found in Jhang. The highest piroplasm overall prevalence was recorded in the samples from Chakwal (110/188; 58.51%), followed by Faisalabad (13/93; 13.97%), Inner Mongolia (16/120; 13.33%) and Jhang (5/169; 2.95%) (Table 2). The results of the long fragment amplification confirmed the presence of these species. The phylogenetic tree revealed the relationships between these species. In Pakistan, small-holder cattle farming systems are common for both commercial and domestic purposes in resource-poor rural communities. In recent years, farmers have adopted commercial farming using modern techniques and imported breeds of cattle (Bos taurus) because of their higher milk yield potential. However, the imported animals are more prone to ticks and tick-borne diseases compared with the local breeds (Bos indicus), resulting in mortality rates as high as 80% in the former compared with < 20% in the latter animals. Among many tick-borne diseases, bovine theileriosis, predominantly caused by T. annulata, is considered among the most economically notorious diseases . To date, most studies of bovine theileriosis have been conducted by using conventional microscopy, which, because of its low sensitivity and specificity, does not truly represent the actual distribution of the species involved. Recently, a study reported the prevalence of T. orientalis from imported and native bovine populations of Pakistan, describing 24.5% positive results in imported animals as compared with 6% positive results in native cattle . In China, four Babesia species (B. bovis, B. bigemina, B. major and B. ovata) have been described as being responsible for cattle, buffalo and yak babesiosis [29, 30]. Recently, Liu et al. detected a new bovine Babesia, similar to B. venatorum and Qin et al. reported an epidemiological study of B. orientalis in China. Among different members of Theileria, T. annulata, T. orientalis and T. sinensis, have been reported to cause the disease in China . Recently, T. luwenshuni was reported for the first time in yaks . 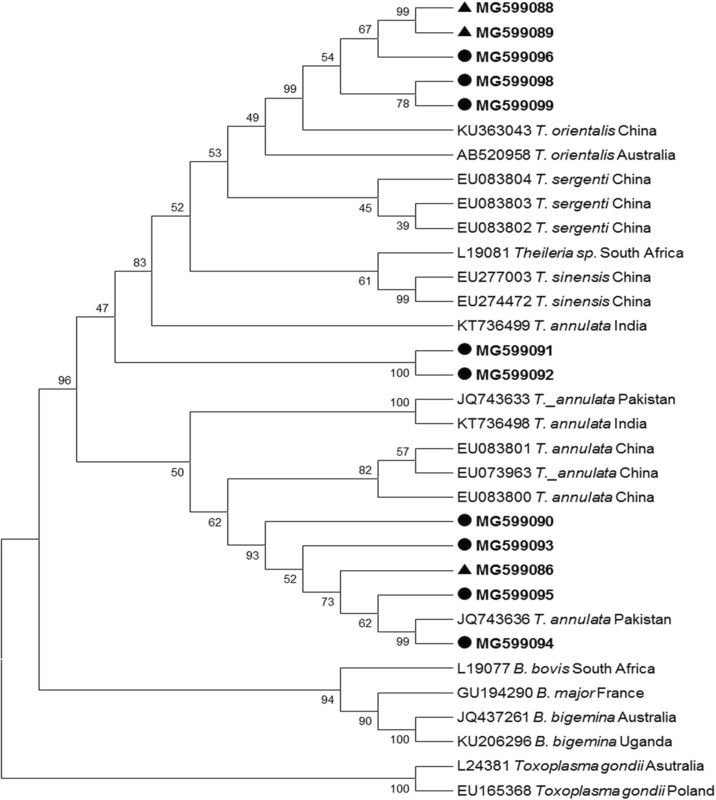 In the present study, phylogenetic analysis of T. annulata short sequences showed maximum similarity with sequences already reported from India and China, whereas, on the basis of long fragment amplified sequences, most of the T. annulata sequences were found to be closely related to sequences already reported from Pakistan  and Iran (GenBank: KF429799). A few short sequences of T. orientalis showed similarity with sequences already reported from China, whereas others showed a close relationship with sequences from Japan. 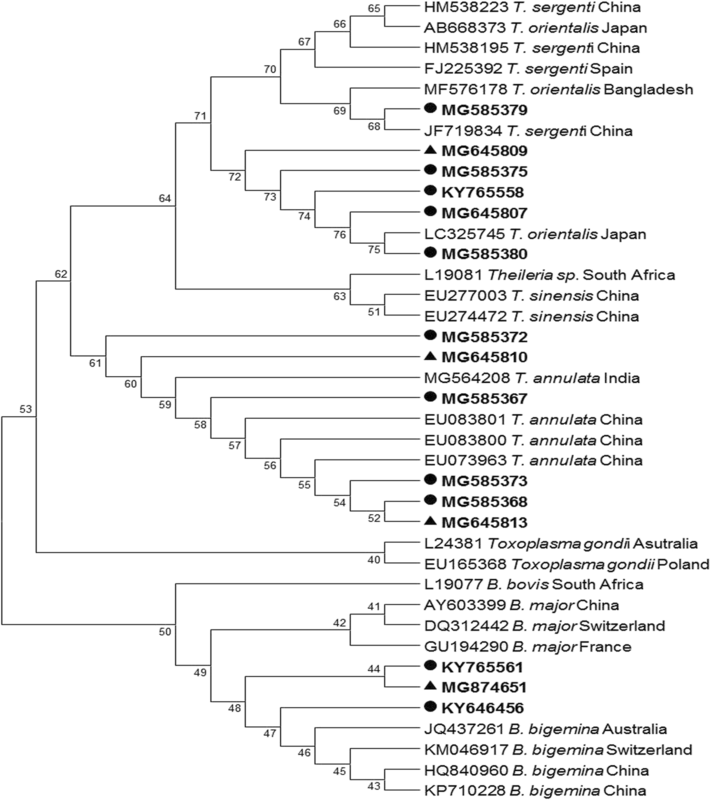 Some of the long T. orientalis sequences reported from Pakistan were closely related to sequences already reported from China (GenBank: KU363043) and Pakistan (GenBank:JQ743636), whereas a few sequences were not closely related to sequences in GenBank and appear to be distinct (GenBank: MG599098 and MG599099) (Fig. 3). The sequence JQ743636 was obtained from gDNA of cattle imported from Australia to Pakistan. This shows that the disease in native animals might have come from infected imported animals. The B. bigemina short sequences were analyzed by using other reference sequences of the same gene . These showed a relationship with reported sequences from Australia, China and Switzerland (Fig. 2). The long fragment sequences revealed a relationship with sequences reported from China and Argentina, with a few sequences occupying a distinct position in the phylogenetic tree (Fig. 4). The present study reports the simultaneous detection of multiple piroplasm species, and the genetic relationship between them, from selected areas of Pakistan and China. The results of this study could be helpful for providing a basis for vaccine production and control strategies for these economically important piroplasmosis. The authors acknowledge International Science Editing to improve the English of the manuscript. This study was financially supported by the National Key R&D Program of China (2017YFD0501200, 2016YFC1202000); 973 Program (2015CB150300); NSFC (No:31402189, No:31372432); ASTIP, FRIP (2014ZL010), CAAS; NBCIS (CARS-38); Jiangsu Co-Innovation Center for the Prevention and Control of Important Animal Infectious Disease and Zoonose, and State Key Laboratory of Veterinary Etiological Biology Projects. The reference sequences of the present study were submitted to the GenBank database under the accession numbers as follows: T. annulata (KY626168, MF427698, MG585358-73, MG599086-87, MG599090-95, MG645810-13); T. orientalis (KY765557-58, MG585374-83, MG599088-89, MG599096-99); B. bigemina (KY646456, KY765561-62, MG874651-56). JL, HY and GG planned the research. MAH and NI collected the samples. MAH, MR and JL conducted the experiments. MAH drafted the manuscript. JL and GG revised the manuscript. All authors read and approved the final manuscript. The present study was approved by the Animal Ethics Committee of Lanzhou Veterinary Research Institute, CAAS (No. LVRIAEC 2013-010). The procedures for acquiring the field samples were approved by the Animal Welfare Ethics defined by University of Agriculture Faisalabad, Pakistan.